FRANKFURT, Germany — HARMAN’s Crown Audio today announced that it is now shipping its new DriveCore Install (DCi) Series power amplifiers. Successor to the company’s acclaimed CTs Series, the DCi Analog two, four, and eight channel amplifiers incorporate a host of improvements including HARMAN’s exclusive DriveCore™ technology to set new industry standards in sound quality, flexibility and efficiency. Twelve models in the DCi Series are available ranging from 300 watts to 600 watts of minimum guaranteed power into 4 and 8 ohms and 70Vrms and 100Vrms. The first number in the model is the amount of channels and the second number indicates the watts-per-channel power rating. All amplifiers are just 2U rack spaces high, to conserve valuable installation space. DriveCore technology dramatically reduces the footprint of the amplifier by replacing over 500 parts from a typical amplifier design with one single IC. 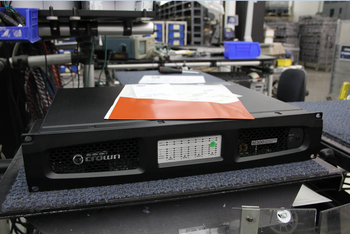 Smaller amplifier engines means more channels can be put into a 2 RU box with more capabilities. Crown DCi Series amplifiers can be operated into 8-, 4- or 2-ohm loads and offer direct drive “constant voltage” capabilities for 70Vrms and 100Vrms amplification without the need for a step-up transformer, yielding higher audio quality and more power available at the speaker in distributed audio applications. The amplifiers incorporate an exclusive Power Factor Corrected (PFC) global power supply that is designed to deliver maximum power in any country and their universal AC input accepts voltages from 100 – 240 VAC, 50/60Hz (+/- 10%). The DCi Series is Crown’s greenest amplifier line ever, with a PFC power supply, a selectable powersave auto-standby mode where the amplifier will power down after 30 minutes of no input signal and consume less than 1 watt. In addition to the amplifiers’ balanced 3-pin input connectors and 2-pin terminal strip output connectors, a rear-panel AUX port enables the amplifiers to be integrated into control systems for remote on/off and amplifier fault monitoring.